The Blue Microphones Yeti Pro is the described by blue as ‘the world’s first USB microphone combining 24-bit/192 kHz digital recording resolution with analog XLR output”. 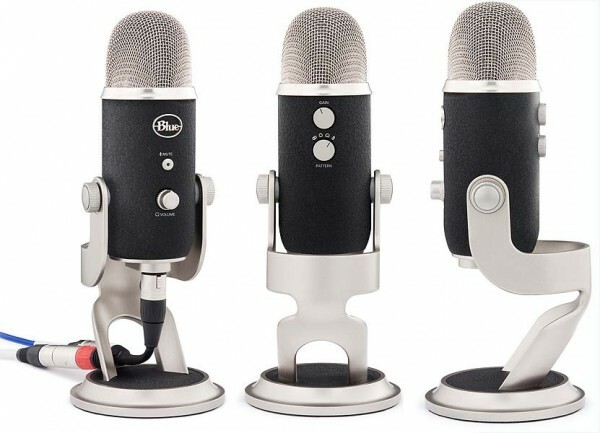 At $250, it’s probably not going to be a first podcasting mic or mic for general recording. But, given its power and flexibility, the Yeti Pro is a great first ‘grown up mic’, when you’re ready for a microphone that offers professional features and audio quality. Three custom condenser capsules and four different polar pattern settings: Cardioid, Stereo, Bidirectional and Omnidirectional. The first thing you’ll notice about the Yeti Pro is the mic’s weight and style. The Yeti Pro weighs a little over 3 pounds on its stand, so it feels extremely solid. Everything appears to be made of metal and features gorgeous finishes. Stylewise, the mic looks like it was inspired by vintage designs, but isn’t slavishly retro. On the front, there is a mute button and a volume knob for the headphones. Around the back, the Yeti Pro has a gain knob and a four-position switch for setting the mic pattern. Finally, on the bottom, there are the connectors – for USB audio, analog output, mini headphone jack and a threaded mic stand mount. The mic base has no-skid pads on the bottom and has enough weight to keep it firmly in place. There are two knobs on the stand that you can loosen to adjust the position of the microphone. The necessary cables for using the Yeti Pro are provided, including a USB cable and a stereo XLR splitter. In addition to the design and build quality, there are a couple of features of the Yeti Pro that make it stand out. The Yeti Pro offers both digital and analog output. This is a great feature, because it make the mic a plug-and-play solution for your computer, but also lets you use easily use it with traditional analog gear. This also may offer a bit ‘future-proofing’, since you won’t be locked into the existing USB output. The Cardioid setting is good for typical podcasting and vocal work, with a unidirectional pickup pattern. That means it will primarily pickup sound hitting the front grill of the mic. The Stereo setting is good for when you capture ensembles, or just to capture a stereo image. The Bidirectional setting might be useful for doing interviews or other situations where you want to capture sound from both sides of the mic, but still screen out ambient sound. The Omnidirectional setting configures the mic to captures sound equally in a 360 degree circle. This could be useful for capturing small group discussions. For basic use, you can plug the Yeti Pro in via USB, set it to Cardiod, adjust the gain and forget about it. But, if you need a mic for just about any other situation, you can quickly adjust the Yeti Pro and be ready to go. We found the Yeti Pro to be a no-brainer to use. On the Mac, it’s a plug-and-play device. You plug the USB cable into the only place it will fit on the mic, plug it into your computer, and it works. Better yet, it delivered excellent results on everything we tried it with. In GarageBand, the Yeti Pro shows up in the Input Source drop-down as Mono 1, Mono 2 or Stereo 1/2. This lets you record from the mic into mono or stereo channels. The built-in headphone amp is a nice feature that avoids the funky echo effect you can get if you monitor the audio after it’s gone in and out of your computer. The Yeti Pro is a very nicely designed mic, with excellent build quality and advanced features that make it a flexible choice for a first ‘grown up’ microphone. The metal connectors of the Yeti Pro stand lock down directly against the mics body, which will result in paint chipping if you take the mic on and off the stand. If you’ve used the Yeti Pro yourself, let us know what you think of it!